When you are new to camping, there are a lot of things you need to think about. In fact, you will find that's a big part of having a good camping trip. Because being hungry is no fun. Meals are also a time when everyone gets together, either around a table or the campfire, so food becomes a very social part of camping as well. Planning this part of your trip needs some thought as your trip approaches. Especially if you have children as you might have to cater for their voracious appetites! You do need to do a bit of preparation work before you leave home. The reason behind this in most cases, is that being new, you want to spend your time enjoying yourself, not stressing about the next meal and getting it cooked in time. As you get more experienced with camping, you might find that some of the work before you leave the house is less or you have got faster and more organised with the cooking at the campsite. Most campers I know, still do a bit of work before they head out for the camping trip, and we are no exception. Below are all food preparation tips for you before you leave the house. This is a guide to make your camping food, simpler and less stressful. 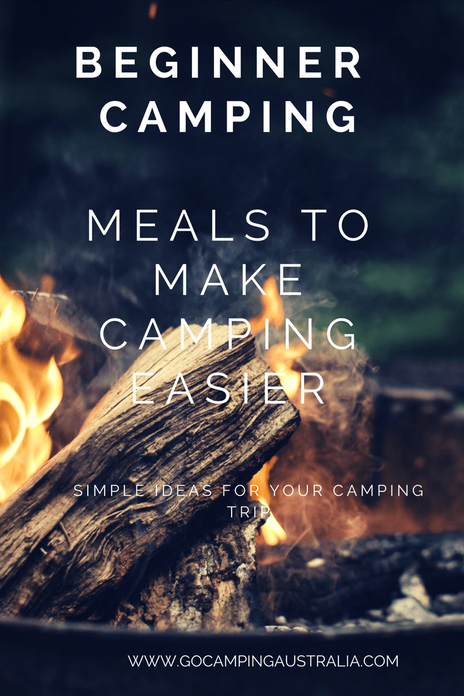 If you need to know recipes to start you off, read Beginner Meals for Camping. Whether you are going away for 1 night or longer, it's a good idea to have a plan of the meals you will eat when away. You should jot down your breakfast, lunch and dinner meal plan for every day you are away (or won't be accessing shops). Include snacks and drinks on this list. This page, Camping Meals for Beginners will give you some ideas. It might sound a bit over the top writing down every meal you are planning on eating, but its a great way to work out what you need or if your list is getting too long, modify before you shop and pack. Think about each meal and the ingredients you need to make that meal come together at the campsite and the utensils and cooking method for that meal. Breakfast at home might be easy - bowl of cereal and a coffee - because it's all there in your kitchen. If you want to replicate that meal when away - you need to think about everything that you have to pack to do so. What sort of heating method is needed to prepare that meal? How long will the meal take to prepare? Will I have time to make this meal at the campsite, or will I want to? When you have worked out your meal plan and purchased the ingredients, then you need to get organised! Planning your meals tip - keeping breakfast simple and fuss free, is recommended. Don't try to recreate a gourmet breakfast for every day of your camping trip, especially on the day you are packing up and leaving. Have a delicious breakfast by all means, but trying to do that every day of a camping trip means you are committing yourself to probably more work than you want. Organising your food supplies helps a lot. It might seem overly simple and obvious, but when you are camping in the early days, having food and utensils all jumbled in together, makes cooking more complicated than it needs to be. And you don't want that. First up you have all the goods that need refrigeration - they are going to go into your esky/cooler/fridge, so that's easy enough. But what about the rest of the goods? You need to probably invest in some strong plastic boxes (with lids that don't come off easily) to store all the food. Think about getting 2-3 if space permits. As we are are discussing camping food for those who are car camping, only you know your vehicle space requirements, so do think about how you can fit in these boxes plus everything else you are taking on your trip. Box 2 can be the non perishable core ingredients for your meals (based on your meal plan). The volume of these ingredients really fill up this box. So further down we are going to discuss more about this issue and ways to help you fit it all in. Only take the cooking gear you actually need to prepare your meals. For example: a colander is fantastic to have for draining rice and pasta, but if your meal plan doesn't involve either of those ingredients, don't take it! This gear can be bulky so you need to be ruthless, and try to get the same utensils to work for more than 1 meal. We have a story on collapsible camping gear, which shows you that not all gear needs to be bulky. Making a meal before you go, that you can reheat or serve at the campsite might sound a bit like cheating on the camping experience. Having a meal ready to go is a god-send. The hard work is done, and all you have to do is serve it up (heated or not, depending on the food). Arriving at a campsite and setting up all the gear and then having to think about what to cook if you are tired or have travelled a distance, can be a little tiresome. It's great to have something relatively simple to serve. When doing your meal plan, think about what you can make before your trip. It might be that you can cook the bulk of the meal at home, and then at the campsite add to it with other ingredients or accompaniments (all of which will be in the food boxes mentioned above). The beauty of some of these meals you cooked at home, is that you may have made it weeks ago and frozen it. Now, when its camping time, just pull it out of the freezer and into the esky. For beginners, I highly recommend this as an option. You can make other meals from scratch around the campsite - on this trip or another - but having at least 1 main meal ready to serve with minimum fuss, is fantastic! Need food fast and desperate for a meal you don't need to prepare: Look at dehydrated food options, like Back Country. This tip goes very closely with the one above. 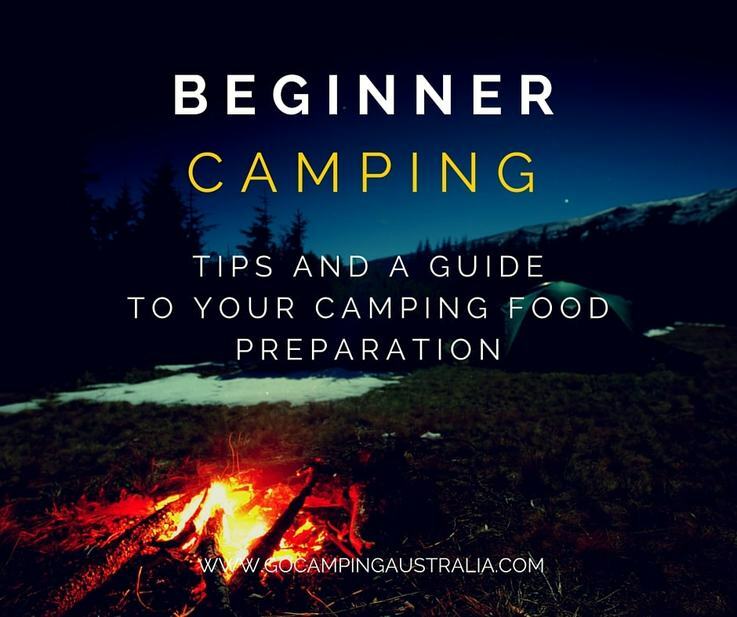 It's all about food preparation before you leave home and a good idea if your camping trip is going to be more than 1 night (under 1-2 nights, you might not find this as relevant to do, especially in cooler camping weather). Apart from freezing a meal to serve, freezing food helps keep your esky cooler. Think about what you can freeze - there is a lot that can be frozen safely. You might be so used to having a fridge at home, you don't have to worry about longevity of food, but when camping, frozen food means it will last longer plus the benefits of keeping everything cool. If you can, place the food in the freezer for a few days prior to the camping trip; this way you know the food will be frozen properly and not a slushy mess. The food that you will be using last on the trip, should be packed at the bottom of the cooler. For food safety (and your health), always ensure you defrost in the esky (don't leave outside on the table to speed up the process) and reheating any food, reheat at 75 degrees Celsius or hotter. When you have all your meals planned, ingredients purchased and you are ready to pack it all into boxes, it's frightening how much there all is when you put it all together in one spot. You might be thinking "how on earth am I going to get all this to the campsite?" It's a valid question. You need to downsize. Not necessarily discard any of your food, but make it more space efficient. These next 5 tips are key to that concept. Good strong zip-lock bags are a great purchase when camping. They have loads of uses, but right now for this story, we will concentrate on food and zip locks. Note: strong bags are important to the success of this concept, plus having a variety of bags in different sizes - you don't want leakage, especially if its holding liquids. Buy quality, such as the brand Glad. You will put much of the ingredients that you need for your trip in them - out of their bulky boxes and packaging. Many of these bags will have a spot where you can write in permanent marker what is in the bag. Do this, and even write what meal this bag is designated for, so you don't wonder what or why you packed it. Look at any of your dry ingredients you are taking: measure out what you will need for your trip, and put into a strong, zip lock bag. You will save wastage at the campsite, plus room. Examples of things you might put in these different size bags is cereals, flours, sugar, spices, pasta. Canned goods can also go in the plastic bags, especially if you won't be using the entire can. Freeze meals in these strong bags too, and then you have another item to put in the esky and act as a cooler. Planning on making bread, damper or pancakes? Then all those flours, sugar etc should be measured out at home and then combined into a zip lock bag. If you want, and something which I find helpful as I can't remember recipes, is to write on the plastic bag, what needs to be done to complete the recipe. For example, if its a pancake mix, I would write that I need to add egg and milk (listing the exact quantities of both), on the plastic bag. This tip is about doing work in advance and using a zip lock bag! Don't bring the marinade bottles or ingredients to marinate your food at the campsite. That's a lot of extra things to carry, and you might just forget something to make the marinade. Make the marinade, add the meat, and then transport all in a strong ziplock bag. Depending on when you are planning to eat it, you might freeze it all prior to camping. Then you have another item to cool your esky down with. This tip applies to food that won't go brown. Cutting up food around the campsite is OK if you have the time, but to minimise that work, you may choose to cut certain foods up before you leave home. For example: a roast meal on the campfire - we cut the carrots, pumpkin and other vegetables up before we leave home. That means all the parts of the vegetables we won't be eating (like the skin) is disposed of at home, not at campsite, plus less weight and more room. Onions are great to cut up at home, and store in zip lock bags (double bag sometimes help to minimise odour). When you go to fast food places/restaurants/cafes, you sometimes get little packets of sauce/sugars/jams/Vegimite/dipping sauces/salt and pepper etc, served with your meals or in a 'help yourself' section. It depends on where you go, and sometimes you even see small sample items at supermarkets. Hang onto these little packets. Once you start looking at them as camping supplies, you will be surprised how commonly found they are. You may not need to take a whole jar of jam for a trip if you have a sachet. I am not saying for you to empty entire loads of these items into your bag when you see them, but rather than leave them on the side of your plate if you don't need, hang onto them! If you are going to be out of range of shops for a few days, and space allows, then in your camp box you might want to pack a few emergency ingredients to help you. This is totally up to you and your camping trip needs but if you are going to be somewhere remote, we have a few emergency ingredients that we think are handy to have. UHT milk - this long lasting milk needs no refrigeration until opened. This milk, readily available in all supermarkets, allows you to get that dairy intake without having to rely on fresh milk in your esky for the entire trip. In the past, at the end of a longer camping trip, we have used UHT cream (for a pasta dish) and UHT custard for a dessert. Kept in our food box, it saved us a trip to the shops! Dehydrated food - found in all the supermarkets are packets of dehydrated food that just need boiling water to be added to make a meal. This includes the dried soup mixes in sachets (take up no room if you just pack the sachet, not the box they come in). If one of your meals doesn't work out, or your trip is extended unexpectedly, one of these packets in your food box can keep you from being hungry. Or try the dehydrated ready meals - see full range here. Back up meal - Like the dehydrated food, a good back up meal is pasta/cous cous and a bottle of pasta sauce or tin of fish. If a meal you had planned doesn't work out, having something fast and simple that you can throw together is handy . What you like to eat will determine what your meal is, so find something you like, doesn't take up loads of room, requires no cooling, and is fast to cook/prepare. All of the above might seem like a lot of work. Don't give up on it though, as the more you camp, the easier the planning process is. You will find out what works for you, what you like to do in advance and what you want to do at the campsite. Your food boxes will be half prepared with the staples - all you need to do is make sure you have the fresh ingredients. Find meals that you like to make at home, and double them (put one in the freezer for a last minute camping trip). See what meals you enjoy at home can be replicated without too much work at the campsite. Trial and error with camping also applies to food. There will be successful meals and ones where it was not so great. But doing some planning in advance of the trip might help minimise some of the average meals, and let you enjoy some delicious food cooked in our great and beautiful country. Need more beginner camping tips? Then read them now, so you know all you need to know! To find your meal inspiration, click on the image below!